Yesterday was our first day back to school from winter break. The snow decided to come a little late this year and we had a few inches over the weekend and more expected later this week. So as I hit the snooze the first couple of times, I also checked the news page for closings and delays. No such luck, it’s back to school and work we go. We spent some time with family at Christmas and a few lazy days back at home. We all stayed up way too late and slept in like teenagers a couple of days. Our sleep schedule, eating schedule was all way out of whack. A few days, we ate lunch around 3 so we weren’t hungry for supper until after 9 pm and the girls were still playing and running all over well past 10. My husband and I definitely had the chance to catch up on some TV. We binged on a few shows, finished up a season of one of our favorites and started a couple new ones into the mix. Towards the end of winter break, we were all ready to have some routine back. A normal bedtime, a normal lunchtime and it was about time we be a little more productive before noon. It’s so fun and exciting to decorate for Christmas and I love how cozy the house feels, but when the holidays are over, I’m ready to have the decorations boxed up and the house back to normal ASAP. So we accomplished getting all the decorations put away which felt great. The house feels so clean and maybe a little more airy and brighter for sure. It kind of gives me the Spring Cleaning fever, expect it’s January 2nd or so. I would not consider myself a neat freak by any means. I like a clean house with the floors vacuumed and tables cleaned off, but those closet doors better stay closed. Don’t even think about snooping in my growing number of junk drawers and messy closets. If only my Aunt Cindy lived closer. She’d have me and this house whipped into shape in no time. I think I need a few more of her cleaning genes in me. I want to really work on organizing and trying to get the most out of our house. It lacks the storage of our old house so I’m constantly yelling that I can’t find anything, or dodging the avalanche that falls every time I open a certain closet. One area that I’m going to start with is my own closet and bedroom. It’s become a catch-all and looks messy with the stacks of laundry staring at me from across the room as I type this. My pretty little bedside table is cluttered and I’m ashamed. It deserves better. My husband and I joke about how we are on the girls to keep their rooms clean, but ours is looking pretty messy. And those sassy girls often throw it in my face about how our room is messy while I’m pointing out all the items on their To Do list. I want our room to be a relaxing space with style. We have a mismatchy collection of furniture that I searched and searched for and it needs to be showcased, not hidden under magazines, books, and piles of mismatched socks. Really – I have a Mt Everest of mismatched socks of the girls’. It just keeps growing and growing, meanwhile the girls’ feet keep growing right on out of all those mismatched socks. I’m kind of nut about it too. I will go through the pile and try to find a few matches. I’ll try to make a game out of it for our youngest, but the matches are getting harder and harder to find. It’s like a never-ending seek and find that makes you lose your marbles. I will be folding laundry and a little lonely sock stares at me from the bottom of the basket. I will search all the girls’ drawers thinking that I swore I just saw it’s match a few days prior. Sometimes I get lucky, but most of the time I don’t and the lonely sock heads to the mismatch sock basket. I just don’t understand. I think I still have a bin of mismatched baby socks somewhere in this house. Now I know there’s no hope for those poor itty bitty things. I’ve read that if each person has a washable mesh laundry bag, then they can just remove their stinky dirty socks from their feet and put them directly into the laundry bag. The bag and all the socks can be washed and dried and hopefully solve the issue of losing socks. Seems like a great plan. Sadly, really sadly – I know I own two of those washable mesh laundry bags from when the girls were babies. Guess I need to find them and give that a try. So with all this talk about laundry, I thought I would tell you about the Wool Dryer Balls that I purchased several months ago. I had wanted some dryer balls, and bought a set of two at Bed Bath and Beyond, but I knew that I really needed a few more to help the drying process. 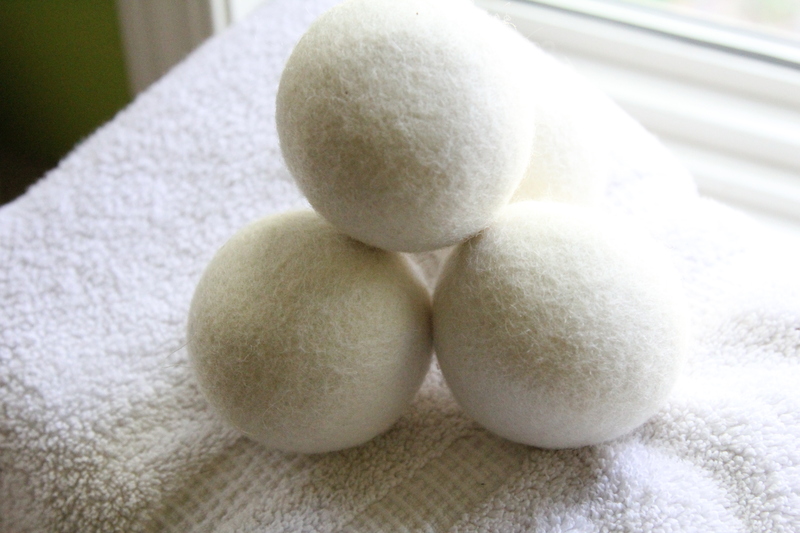 I looked up ideas on making your own dryer balls. I researched and mentioned it to my husband who kind of laughed and rolled his eyes at the same time (is that even possible?). He suggested that maybe it would be better to just purchase the dryer balls as he knows how I am with starting projects and then maybe, just maybe not finishing them. Or not being happy with them, questioning myself the entire time and wishing I had never even started the silly project to begin with. There’s a whole joke about a chair. I’ll share that with you some other time. As I researched, it sounded fairly easy, but when I priced out the yarn, it was actually cheaper to just buy the set of four wool balls, than it would have been for me to make them myself. 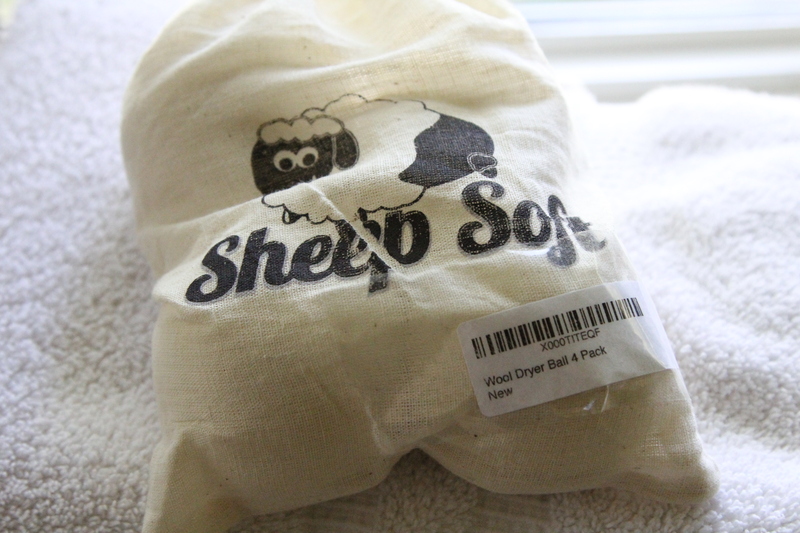 I wanted wool so that I could add some drops of essential oil to them and make my laundry small even better. The ones I bought from Amazon were around $16.00 for a set of four. Here’s a link to them. When I looked them up for the link, there is a set of six for only a few dollars more. I’m proud to say that I have not used a single dryer sheet since I’ve purchased these balls. They are very well made and will last for years. They really do help dry the clothes more efficiently and cut down on static cling. They especially help with sheets and blankets and help to avoid them getting all twisted and clumped up. That is so annoying! I apply a few drops of patchouli oil to a couple of the balls and this distributes the scent through the clothes and makes me happy. I apply a few drops of new oil probably once a week or so. The balls are kind of stained from the oil, but I don’t care. It hasn’t harmed our clothes in any way and trust me I’m on the lookout! The only thing I can note as a negative for the dryer balls, would be sometimes they get stuck in the sleeve of shirts so when you are retrieving clothes out of the dryer, you sometimes have to do a little ball count and try to find the missing ball that may be hiding in a sleeve. So for a more earth friendly way to help dry your clothes, I would definitely recommend purchasing a set of wool dryer balls. I have the set of four extra-large wool ones and the two rubbery kind that I purchased previously. I think six dryer balls would be the minimum to be effective in a large load of laundry. They are fantastic for those with sensitive skin because there are no chemicals as in dryer sheets or fabric softeners. I’ve never been a fan of the powdery fake smell of Snuggle and that bear always creeped me out. This is a great way to add whatever natural scent you like, or no scent at all. I’ll keep you updated on my progress with our bedroom and whole house organization. I’d love to hear your ideas and tricks to help keep your bedroom and closet clutter free. Thank u for sharing yr fascinating blogs. The balls u were talking of I thought was to help remove the little balls u can get on yr clothing. I seldom get it but it is on my little Christmas throw. Do u have a solution to remove and not to ever get it. I I am ready to throw it away but it was a gift and I liked it alot. I hope u can help. About a the balls u were speaking of I will try it. thank u. Thanks for your comment, Ruth. I know what you are talking about. Those little annoying fuzz ball things that end up on clothing after a while. I know they used to sell little battery operated piling shaver things at Walgreens and maybe Beth Bath and Beyond. I just did a quick search on my trusty Amazon and they still exist. I found one that plugs in, but I’m sure if you keep searching, there are some that run on batteries. Another thing you could try is using a razor. It’s basically the same concept as the motorized gadgets. I need to do this on a few of my sweaters that I’m just not ready to part with yet, but are showing their wear! Take Care!